Absolutetly Awesome ! Very friendly ,a most welcoming staff at the office . THIS was my first time here in Quartzsite,Az. I stayed at La Posa South. It has been awesome! Although there is no electricity ,they do have clean / toilets , dumpsters and potable water as well as non potable. They also have non - potable water, and places for emptying our Rv tanks. Yok can buy a pass ($180 to stay for 7 months in the winter,from Sept.15- April 15. If you decide to stay in summer you pay $75. You can cam 14 days and then move 25 miles away every two weeks. There are many options to accommodate your camping experience. I have taken beautiful pictures since being here. I most deffinately will be coming back. We loved this place! It has both tent and RV spaces, you can even get power and water at tent spaces. It has bathroom/shower facilities. There is a restaurant called Pirates Den on site. It has 2 boat launches and plenty of parking. I recommend tenting early spring and late fall, it gets really hot in the summer. This park is right on the shores of Lake Havasu. You could walk to town but we bike down to shopping and the bridge. Large sites. Very busy so book early! This park is next door to Buckskin about ten minutes from Parker right on the Colorado River. It’s one of the prettiest areas in the state. Large sites with a great beach. Lake Havasu is beautiful. This campground has amazing hiking trails that take you around the park and give spectacular views of the lake. The beach is nice, the sites are large. We will be back! Awesome views,peaceful affordable and friendly folks for a bonus. Nature,wildlife awesome views what else do you need? Oh we will be back again! Bbeautiful campground with lots of grassy areas right on the Colorado River. So.very enjoyable and peaceful. Lots of water sports. Would definitely camp there again. The sites are very close together with nothing to separate your site from the next, more specifically, nothing to separate your neighbors septic hose from being the first thing you see and smell when you step out of your door. The bathrooms are cute and decent. Price at the tiki bar was fantastic and the karaoke nights on weekends was very fun. The kids love to swim at the pool at night and watch karaoke. The kids club was nice to have and I actually enjoyed sitting in there with the kids doing crafts. I did not eat at the tiki bar so I can't see anything about that food. This is a campground built like a parking lot. All gravel. There are a couple places in area to eat, and a couple of very overly priced grocery stores. Please do all your shopping before you get there, otherwise go to the dollar store that's in the area for the best deals. The gas in this area is reasonably priced though. This campground is more for the ATV/dirt bike owners. Mostly everybody there hailed some kind of gas powered toy with them. This place appeared to have many trails going for miles in every direction. We walked a few miles on one of them, but it's relatively flat land, and not much to see but sand and cactus. This campground had a very warm pool (90 degrees) and hot tub (104 degrees). It was pleasurable swimming at night, especially when the air is cold. It was like being at a hot spring! There were a few events hosted on the grounds, such as a potluck dinner on Mondays, and blueberry pancakes & orange juice on Tuesdays, hot dog & chips on Wednesdays. Saturdays was movie night with popcorn, and every night the guests would play games at 630 in both community areas. This is where we leaned to play "fast track". There was a small putting green, pool table, a ping pong table, a small library, a crafts area, a laundry room, a small store, shower areas, and a cardio exercise machine. Fire rings are available to rent from the camp store for $5 a day. The cellular service for T-mobile was excellent there, but the water pressure was relatively jumpy from okay to low.. So if you have an on demand water heater like I do, you might want to switch to dry camp mode for stability. Kofa National Wildlife Refuge - Palm Canyon Rd. Free dispersed camping, about 23 miles south of Quartzsite, with no services available, but lots of space and stunning views of surrounding mountains. Camped here for 3 days and loved it! Many RVers were using solar panels instead of generators, adding to the serenity here. In addition to RV access, there are a couple of beautiful tenting areas near the entrance to Palm Canyon. No water or toilets nearby, so plan ahead! Awesome hiking and mountain biking in the area. Be sure to visit Palm Canyon and Kofa Queen Canyon -- very different from each other, but both are spectacular. 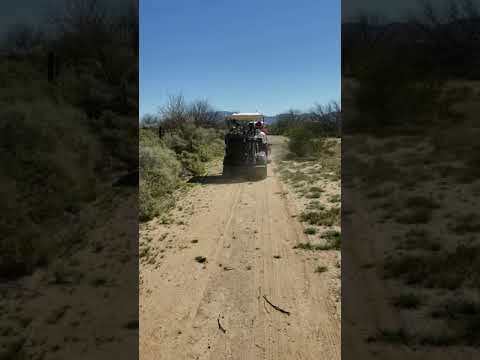 Kofa Queen is accessible via OHV and mountain bike as well as on foot. Palm Canyon is a fun, scrambling hike and much more difficult than Kofa Queen, but absolutely worth it. Sunrises and sunsets are endless and beautiful! Easy access back into town (via Hwy 95) for food, gas, firewood, laundry, and just about everything a camper could need. Great location. Only about 6 miles from Quartzsite, AZ where they have most supplies you need. Cell service in area but slow depending on how many campers are sharing the tower with you. We just got back from our 4th January trip there in a row. 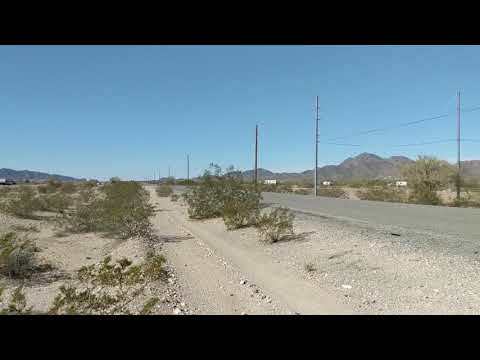 Free dispersed camping, about 4 miles north of Quartzsite, with no services available, but lots of space and beautiful views of surrounding mountains. No trash service, but this area is very close to the Refuse Transfer Station off Hwy 95. Area is quiet with no major road noise. Be sure to register with the Camp Host on duty near the entrance to the area. Many RVers use solar panels for all or at least part of their power needs though, so generator use is minimal. Sunrises and sunsets are endless and beautiful! Easy access back into town for food, gas, firewood, laundry, and just about everything a camper could need. A big sandy parking lot of RV’s with both full hook-ups electric/water/sewer and dry camping options. There are a couple of flush toilets (often no toilet paper though), $5 (passable) showers for anyone to use, and a large dumpster available near the main entrance. The upside is that you can easily walk/bike to the Big Tent RV Show and just about anywhere in Quartzsite, the downside is that you can hear the incessant hum of Interstate 10. The managers are kind people but bring your patient hat! Sunrises and sunsets are endless and jaw dropping! Easy access to town for food, gas, firewood, laundry, and just about anything an RVer or camper could need. Site Just used the showers, as our RV park didn't have any. Free dispersed camping, about 3 miles north of Quartzsite, with no services available, but lots of space and beautiful views of surrounding mountains. No trash service here, but area is very close to the Refuse Transfer Station off Hwy 95. Unlike some of the other BLM land nearby where many RVers were using solar panels, nearly everyone here at Plomosa was using a generator. 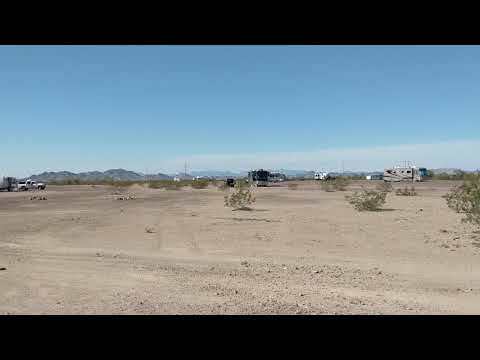 Free dispersed camping, about 2 miles outside of Quartzsite, with no services available, but lots of space and beautiful views of surrounding mountains. Be sure to register with the Camp Host on duty near the entrance to the area. The major drawback is that you can hear the traffic on Interstate 10. Many RVers use solar panels for all or at least part of their power needs though, so generator use is minimal. Sunrises and sunsets are endless and beautiful! Easy access back into town for food, gas, firewood, laundry, and just about anything an RVer or camper could need. Free dispersed camping, about 20 miles outside of Quartzsite, with no services available, but lots of space and beautiful views of surrounding mountains. The major drawback is that you can hear the traffic on Interstate 10. We stayed here for just one night, as we were approaching Quartzsite at dusk and didn’t want to mess with finding a spot in the midst of the crowds after dark. It was a nice, easy stop for the night and put us within 30 minutes of town. Dispersed camping for a nominal fee ($40 for 14 days; $180 for 7 months from Sept 15-April 15; free during the summer months) and just 2.5 miles out of town. You cannot hear Interstate 10 or Hwy 95 if you choose a site close to the mountains. Services available on-site include a few extremely well-maintained pit toilets and trash dumpsters. By paying the fee, you also have access to both potable/non-potable water and a sewage dump at La Posa South, just a few miles down Hwy 95. You are allowed to stay in one place during the duration of your stay, or move around the region. Be sure to register at the BLM office at the entrance to this area. We stayed for a 5 days and found this area very quiet and peaceful. Just a few RVers were running gas generators, while most had solar panels, which always makes things more pleasant. Some folks have their area established for the season hence the funny signs around the property. Gorgeous views of the surrounding mountains and very easy access to hiking, mountain biking, and OHV trails. There are some Native American petroglyphs and grinding holes south of this area, along the main wash (accessible via mountain bike or OHV). Ask the BLM office for details as they are tricky to find, but worth it. Sunrises and sunsets are endless and jaw dropping! Easy access back into town for food, gas, firewood, laundry, and just about anything an RVer or camper could need. 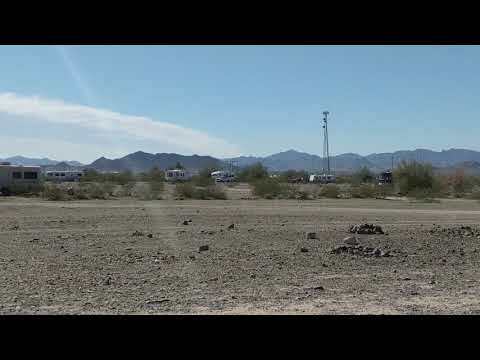 Dispersed camping for a nominal fee ($40 for 14 days; $180 for 7 months from Sept 15-April 15; free during the summer months) and just 1 mile outside of town, though you cannot hear either Interstate 10 or Hwy 95 if you choose a site close to the mountains. Trash dumpsters are the only service available on site, but by paying the fee, you also have access to very clean pit toilets, both potable/non-potable water, and a sewage dump at La Posa South, just a couple miles down Hwy 95. You are allowed to stay in one place during the duration of your stay, or move around the region. Be sure to register at the BLM office at the entrance to this area. Dispersed camping for a nominal fee ($40 for 14 days; $180 for 7 months from Sept 15-April 15; free during the summer months) and within walking/biking distance of town, though you can hear the incessant hum of Interstate 10 on the northern most end of this area. Services available on-site include a few pit toilets and trash dumpsters. By paying the fee, you also have access to both potable/non-potable water and a sewage dump at La Posa South, just a few miles down Hwy 95. You are allowed to stay in one place during the duration of your stay, or move around the region. Be sure to register at the BLM office at the entrance to this area. 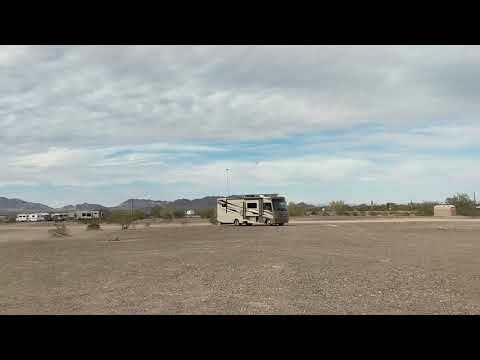 A big dusty parking lot of RV’s with both full hook-ups electric/water/sewer and dry camping options. There are a couple of clean flush toilets and a large dumpster available near the main entrance. The managers are sweet and helpful people and have been in the area for years! The upside is that you can easily walk/bike to the Big Tent RV Show and just about anywhere in downtown Quartzsite, the downside is that you can hear the incessant hum of Interstate 10 and during January show time, it is crowded. We stayed here during the duration of the Big Tent RV Show in 2019 (10 days), while working the Renogy solar booth and easily walked back and forth every day. Free dispersed camping, just 5 miles outside of Quartzsite, with no services available, but lots of space and beautiful views of surrounding mountains. This BLM area seemed to have less traffic and you could not hear the incessant hum of traffic on Interstate 10. You could hear a bit from Hwy 95, but it’s much less frequent and annoying. Free dispersed camping, just 3.5 miles outside of Quartzsite, with no services available, but lots of space and beautiful views of surrounding mountains. Be sure to register with the Camp Host on duty near the entrance to the area. The major drawback is that you can hear the traffic on Interstate 10. Combine that with the folks running generators and the noise might drive you further out of town. To be fair, many RVers use solar panels for all or at least part of their power needs. Scaddan Wash is the site of the annual RubberTramp Rendezvous, held during early January. The famed RTR is a gathering of like-minded mobile dwellers living in everything from new Class A motorhomes to small home-made truck campers. Everyone is welcome and workshops are free! It’s pretty awesome and the numbers of people coming to this event have doubled nearly each year. Be sure to stop at any of the kiosks and get a public use regulation brochure and map. Groups using the refuge will need a free Special Use Permit (SUP). Call for more information (928) 783-7861. Camping is limited to 14 days in any calendar year, no long term. If you want a fire bring wood, it is scares. Wilderness and leave no trace practices are required. Pack-it-in, pack-it-out. The refuge is more restrictive than the surrounding BLM lands. This site is not operated by BLM. It is within the Kofa National Wildlife Refuge (USFWS). Call them at (928) 783-7861. It is dispersed so first come first serve. Road from Hwy 95 is rough and not recommended for small cars. 14 day stay within the calendar year. No long term and no facilities. Oct. thur March is best time. The area is the only location to collect anything on Kofa. No tools allowed, hands only. 10 specimens or ten pounds which ever comes first is the collection limit per calendar year. Get a brochure at the kiosk when you enter the Kofa, it has the public use regulations and a map. Only keep your limit and pictures and memories. Wilderness values and leave no trace practices are best way to be. Checked in to this quiet well kept KOA for very reasonable price with barely anyone in the park for one overnighter. There was a game room, store and DVD rental library. Very surprised to see pool/jacuzzi were clean & warm for nice soak (nice after a long haul in November) Talked to quite a few Alaskans that were passing through morning after at the clubhouse coffee social which was very pleasant while waiting for laundry! Daughter said shower was nice and hot. Not much more you could ask for.